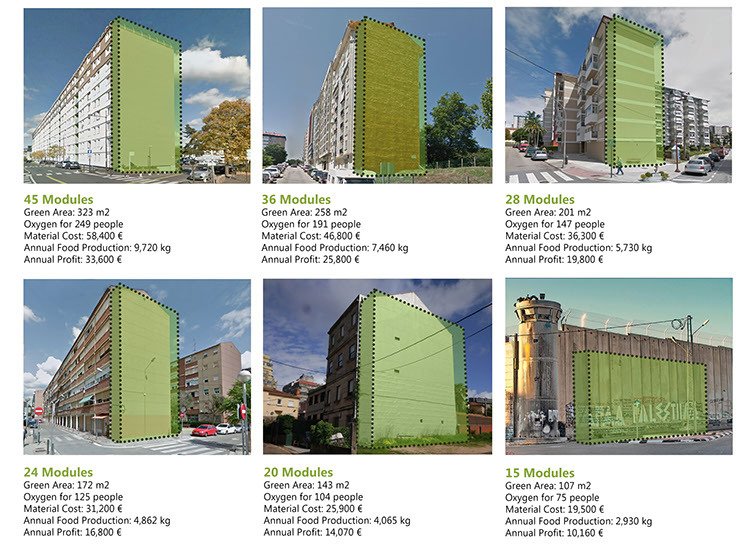 Blank, windowless exterior walls that get plenty of sun exposure could become vertical farms with the addition of recycled modular scaffolding. 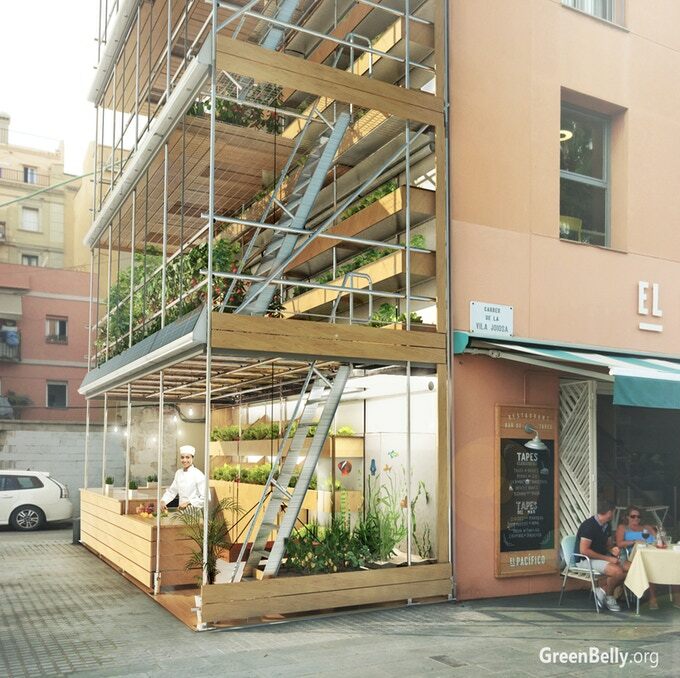 A project called GreenBelly aims to make use of these wasted urban spaces to provide fresh food to the surrounding neighborhood with a system that’s easy to transport, install and remove, and it doesn’t even require hookups to utilities. 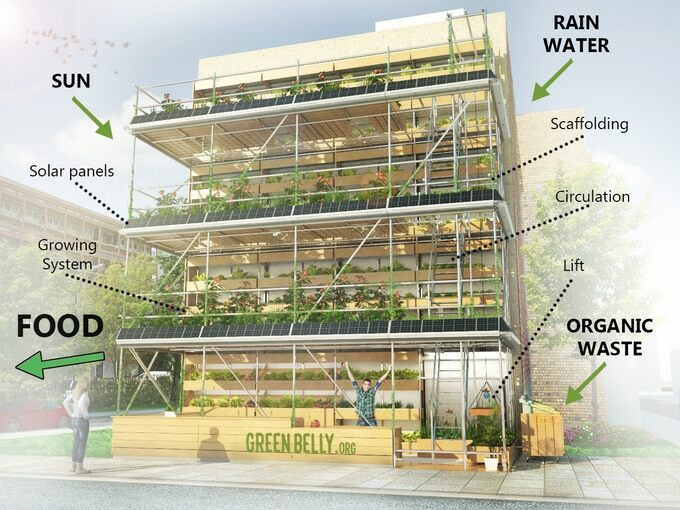 A six-level GreenBelly system made of reclaimed scaffolding and wooden pallets taking up just 35 square meters of land can produce over 14,000 pounds (6400kg) of vegetables per year. 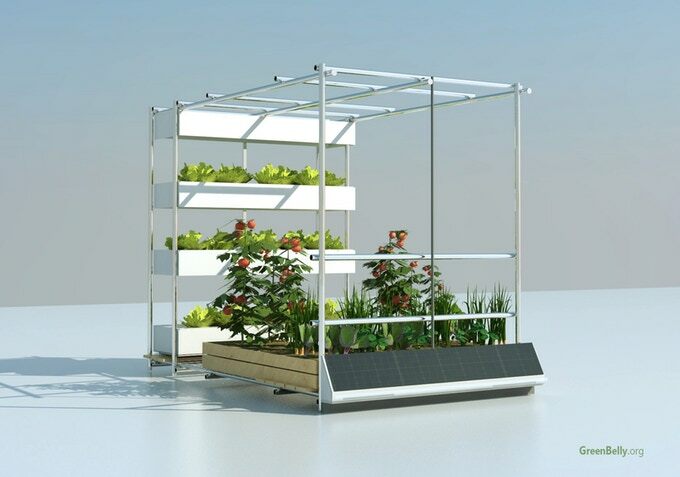 The basic module contains a soil bed, two aeroponic towers and a hydroponic wall, capable of growing hundreds of plants at a time. Multiple modules fit together like Legos, stacking vertically to create multi-tiered open-air structures that harvest rainwater and run on solar energy. The bottom unit contains a farm stand for selling the produce to local residents, and the top level contains beehives to help pollinate the plants and produce honey. Producing and selling food in the same urban location allows the stand to sell fresh produce at fixed, affordable prices. 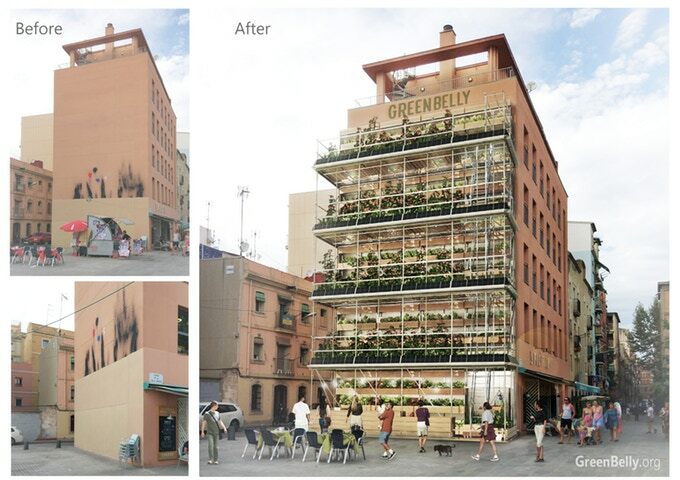 Created by AVL Studio, a design boutique specializing in sustainable architecture, the GreenBelly system could be run as an educational project by a school, an assistance program for homeless people or an addition to an existing restaurant or market, or its individual modules could be rented out to locals in a manner similar to community gardens. How it’s managed would likely depend on who owns the land it’s built on. The architects estimate the cost of a 20-module unit at about 30,000 euros (roughly $35,000 USD), which could be recouped after three years of operation. It’s an interesting proposition for the many blind building facades found in an average city, especially in areas where fresh produce is harder to come by. AVL Studio envisions the GreenBelly system being especially valuable in disadvantaged neighborhoods. They’re currently raising money on Kickstarter to build more prototypes at various scales, which could be exported in containers to places that need them most, like Palestine.